ON THE OCCASION OF QUEEN’S BIRTHDAY ️LONG WEEKEND!!! We do have private/VIP areas to host your special occasions like Anniversary, Bucks night, Birthdays etc… so please let us know beforehand and will take care of everything. Join us for a night you don’t want to miss!!! Officially dropping you all fresh, sonic, funky, & undoubtedly the new phase of reinvented desi sounds. 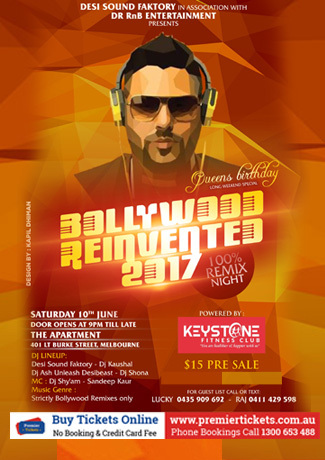 Premier Tickets Australia is proud to be the online ticketing partner for BOLLYWOOD REINVENTED 2017@ The Apartment Bar 401 Little Bourke St. Melbourne.